Having a wealth of Kontakt instruments available at your disposal is great but being able to access them quickly can sometimes be a little time consuming. 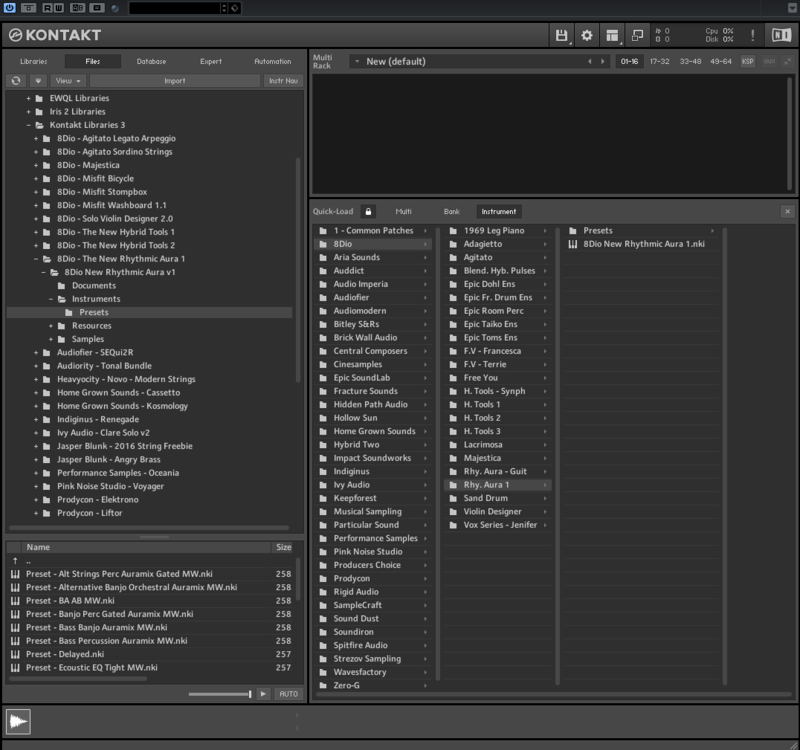 Kontakt Player libraries streamline this process as they have their own separate tab which provides quick access directly to the instruments/multis folders via individual library tabs. But what about all those libraries that aren’t Kontakt Player compatible? You’ll know from experience that navigating through the standard file browser to find a specific patch can slow you down given that you sometimes need to trawl through several nested folders to get to the actual instruments folder, especially with some older libraries. Well there is a feature in Kontakt which should make locating your instruments quickly a lot easier – The Quick-Load feature. The Quick-Load feature allows you to organize your instruments however you like as the Quick-Load catalog is essentially a virtual hierarchy directory structure meaning that no files are actually copied/moved. I myself prefer to organize by vendor as can be seen in the example above. You may, however, decide you prefer to organize by instrument type. Essentially I never have to use the file browser, only my customized Quick-Load catalog, and my Libraries tab. The folder structure can be determined however you see fit. It’s just a case of dragging and dropping the instruments into the desired folders. It all depends on what works best for you. The same can also be done for multis and banks. In order to access the Quick-Load catalog, you just need to right-click in any empty space inside the instrument rack and the catalog will appear. You can then begin creating your folder structure. Once you’re happy with it you can lock down the hierarchy which prevents any changes being made to the file structure. Right-clicking again will close it. Setting up my Quick-Load catalog has certainly helped speed up my workflow so why not give it a try yourself! Previous PostGuitar Pedal Signal Chain BasicsNext PostHow to get started in setting up your own home studio.